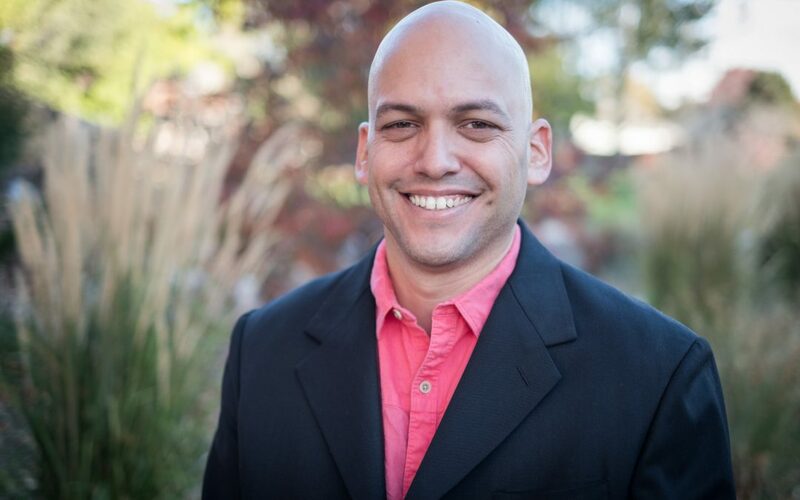 Jorge Figueroa is a Water Education Colorado board member and a long-time climate advocate. After years of working with Western Resource Advocates on demand management, water conservation, and climate resilience in the West, he is now the chief innovation officer for Americas for Conservation + the Arts. There, he is building and running El Laboratorio to promote agricultural and food security in Puerto Rico after Hurricane Maria. Jorge also leads the River Sisters Partnership, which started in March 2018 under an MOU between Mayor Hancock of Denver and Mayor Reina in San Luis Rio Colorado, Mexico to celebrate and help restore the Colorado River from its headwaters in Colorado to its delta at the Sea of Cortez. We sat down with him to learn more about his work around climate change and building resilient communities. Tell us more about your role in El Laboratorio. What is the project and how does it impact climate change, specifically for Coloradans? So, it’s really interesting because for the past nine years, most of my work has been about resiliency solutions for climate change in the West, specifically on water and also educating about and advocating for the urgent need to build drought-resilient infrastructure and systems in the West in order to be able to adapt and thrive under climate change. The [climate change] projections are pretty dire for the Colorado River Basin in general. A place like Colorado that has diverse topography is projected to be affected differently in different places with some areas and microclimates actually getting wetter, but most areas are probably going to get drier. But from a 30,000-foot perspective in the Colorado River Basin, what’s projected is that we are going to have a really high probability, again generally speaking, of having multi-decadal megadroughts that are going to be higher frequency and higher intensity than at the very peak of the medieval period, which was the time in the 1300s where tree-ring data indicates that our region had more than 10 frequent megadroughts. So, for the past nine years I’ve been trying to educate decision makers about the urgency for us to invest in our water infrastructure and our city infrastructure. Basically, all water efficiency strategies, water conservation strategies—we have a whole plethora, a cross-spectrum of tools and strategies within the field of water efficiency and water conservation—All those are tools and strategies that we have, [and] are all adaptation measures of climate resiliency measures for our city. What inspired you to join Americas for Conservation + the Arts? I have been working as a volunteer for Americas for Conservation + the Arts for the past five years. They are also one of the few organizations that has really championed the River Sisters initiative, which I think is really a great model of how to advance ecological and agricultural resiliency by putting people first. After Hurricane Maria, they were the ones who were co-leading the food security movement in Puerto Rico. After Hurricane Maria, with the collapse of water infrastructure and because we are a city, an island, and because of agricultural collapse to the extent of providing less than one percent of the total food demand of the island, many, many people who were working for the environment and who were working in public policy realized in Puerto Rico that food is the highest priority and the most important thing for survival of the culture. And so, as a Puerto Rican, after Hurricane Maria, I decided to quit my job at Western Advocates in order to help with Hurricane Maria recovery efforts, specifically focusing on food security. What happened with Hurricane Maria is that climate change, for me, for the first time, showed that it had the capacity to extinguish all nations, states, governments, and it’s a very, very scary situation. Tell about a project or event you were involved in that relates to climate change, what was the most rewarding aspect of the project? With River Sisters, what I love about River Sisters is that it’s an alternative to the business as usual of the work that environmental organizations have been doing for the past 150 years. I feel that environmental organizations have failed to a very significant extent in helping to protect the environment. If you look at the most important indicators, which is species extinction, we have a rate of extinction that we’ve never had in the history of our planet, with the exception of allegedly a great comet landed in Mesoamerica and extinguished the dinosaur species. And I think that the reason or why environmental organizations have failed to help protect the environment is mainly because in general, their focus is on saving acre-feet and fish species. It’s the other side of the same coin of dislocating people from nature. And so focusing on fish and just saving acre-feet and taking people out of the picture, is just basically the left side of the same coin. That is the root of the problem. What is the River Sisters initiative? So, River Sisters is an approach that is based on the heart, and it’s based on people, and it’s based on just celebrating our shared resources, exchanging information and developing friendships between water leaders. Out of that, beautiful, amazing solutions can happen. So instead of thinking that we have the solutions and then solving them from the top down, River Sisters basically convenes water leaders, gets them together, brings people from Colorado to the Delta and brings people from the Delta to Colorado. In that wonderful, cultural leadership exchange, which is this heart-to-heart, wonderful things and wonderful solutions have come out. So, I’m really excited about that. It’s an initiative that really fills the heart and the spirit while at the same time, supplies a way forward that I think is a model to really be able to achieve the transformative change that we need to achieve in order to be resilient to climate change. How does AFC+A work to leverage the arts for conservation gains? One of the projects is the viability analysis and market analysis [determining] if we can build a sister Red Rocks Amphitheatre in the Colorado River Delta to help bring the Colorado River back to people through music. That’s one example of how you can use arts for ecological restoration and water security. So, Red Rocks is run by Mayor Hancock and the Denver Arts Venue. In the last five years, after they’ve paid their vendors and artists, it generates net for the city about $25 million a year, and our partners in Mexico have calculated that all they need is about $11 million total … to have the Colorado flowing in perpetuity in the urban reaches of the river. And so, it’s possible to build a sister Red Rocks Amphitheatre, or it might be possible, and to use a portion of the revenue from the tickets in Mexico to help aid and pay for perpetual water rights to bring the Colorado River back to the sea with music. And in a way, it’s a much more common-sense solution than relying on private foundations to pay for that. It democratizes the sources of revenue, it provides a renewable source of revenue, and it relies on an industry that is depression- and recession-proof, the entertainment industry, and also leverages something that Latinos are really good at, which is making art and making music and enjoying music, and that’s just one example of how you can use art and music to help protect and restore the Colorado River. Has being a WECo board member helped you increase your environmental impact? Being a board member has been a really fantastic opportunity for me to meet some of the most knowledgeable and well-respected water experts in the United States and Colorado just by virtue of working with them and Water Education Colorado. It’s been not only an honor, but also really powerful, both in the networks, the friendships, and just the knowledge that I’ve gained. I think there is huge work that needs to be done in the area of bringing more leaders in the water field that are from different cultures whether they are black, Latino, [or] Native American. I think it’s critically important for organizations to diversify their leadership … we really need to have diversity of ideas and perspectives, and that’s what having new voices and people from different cultures will help achieve. And so, I think it’s important to have more diversity. I think we are very far away from having diversified membership of not only Water Education Colorado, but also of folks that are invested in water. And so, with Latinos being like 30 percent of the users of the Colorado River, I think it’s really important to bring different voices to the table. This interview was first published in the Spring 2019 issue of Headwaters Magazine. View the flipbook here.